Apartment on the first floor of the residence La Gardiole 4, a small two-story building. The residence is quiet. Outdoor parking spaces are reserved for residents. The apartment consists of a living room with kitchenette (sink, electric hob, oven, fridge, cupboards, no washing machine, dishwasher), window with balcony overlooking the tennis and spa, a sofa- 2 bed for two people, a small room with two bunk beds and an alcove with two bunk beds, a bathroom with tub-shower, sink and closet, and separate WC. There is a private ski locker locking in the dedicated space in the basement. 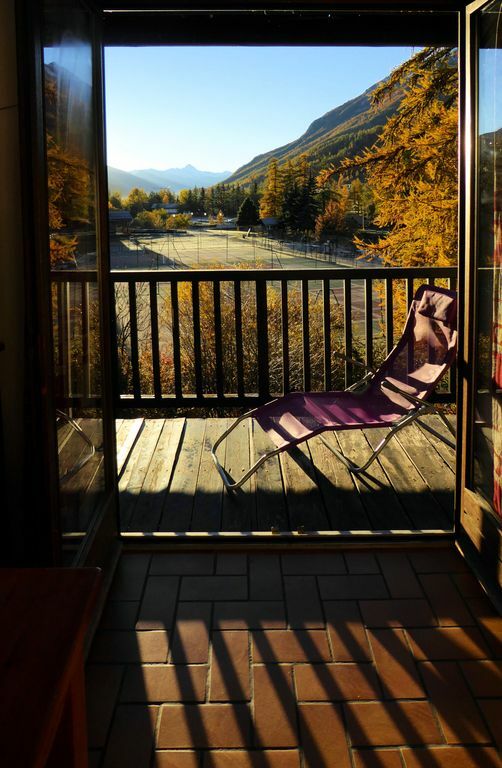 The apartment is located 250 meters from the ski lifts, 50 meters from the cross-country ski trail along the river (Guisane) and 250 meters from the village center, where there are all the shops. Rental is normally a full week. Unless special arrangement, a partial week is charged in full. There is no internet in the apartment (you can use a smartphone as a mobile Internet access point, the network is good). Contacter le propriétaire. Possibilité de changer la date d'arrivée au dimanche au lieu du samedi.